Hey, Down Unders. It's been a tough time over here with Wombly. Over Thanksgiving my car caught on fire and during the kerfuffle of panic and moving things from car to car and everything a horrible accident occurred. Wombly had something happen to his eye. The doctor's are still looking into possibilities of surgery, and it's been a little bit rough. But, he's been feeling a bit better so he thought it would be nice to try and get back into the swing of things over here. He also did the artwork for Garden of Eve by KL Going. I loved the jacket cover of that book. Ohmygoodness. I want to go find the other books he's jacket illustrated now. They're so prettttty. Ahem. Moving on. 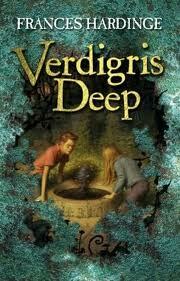 The story is about three kids Ryan, Josh, and Chelle who steal coins from a well. What they don't realize: they stole the wishes as well. Weird things start happening. Electricity spazzes out around Josh. The voices of the wishers comes out of Chelle's mouth whenever she's around them. And Ryan? Ryan has creepy little eye warts pop out of his knuckles. Um. Gross. 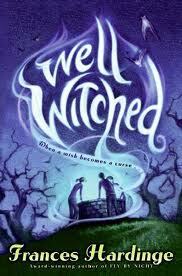 The three friends start trying to fulfill the wishes for the Well Witch, but everything quickly spins out of control. 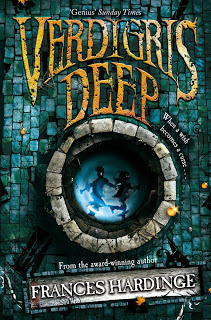 1) Frances Hardinge wrote it. 2) The characters are interesting and flawed. I wanted to punch Josh in the face so bad, and pat Ryan on the head, and sit down and listen to Chelle. They felt so real. 3) The story is fast paced and flows so well. 4) There are sentences like this: “There was a penny of panic in his throat” (37). 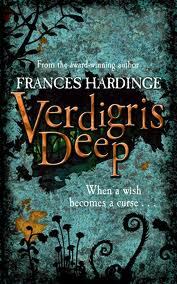 Frances Hardinge writes complicated worlds that are so unique and compelling so you want to dive into the book and live there. Except. That. There are also unsafe things. So. You might get emotionally scarred if you actually end up in one of her worlds. Ahem. Anyway. This book is great for anyone, but in particular for boy Down Unders. The story is fast paced and slightly creepy. Perfect. ALSO: if you check out Hardinge's website there is a secret story you can read that starts here. I'm horrible with codes so I haven't figured out the first clue yet.